There’s a common problem with many landlord pet policies: they tend to be developed in a vacuum. Most of the time, prospective tenants already have acquired their pets, so landlords who don’t sync their pet policies to the applicant pool tend to limit their options for qualified renters. 1. Refusing all pets, including companion animals. No-pets policies have one important drawback: landlords still must accept companion animals prescribed for tenants with disabilities. Should a landlord reject an applicant who requests a companion animal because of a no-pets policy, the landlord may be prosecuted for discrimination and pay significant fines. The same is true if an existing tenant becomes disabled and requires the animal. 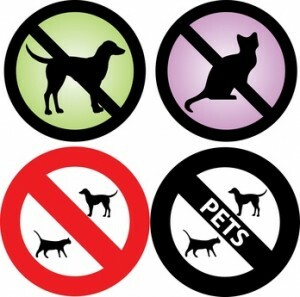 Even in the event of a no-pets restriction, landlords must adopt a policy for dealing with companion animals. 2. Applying pet policies to companion animals. Requiring applicants who have companion animals to pay a pet deposit, higher deposit, pet rent, or to live in units designated for pets is illegal. So is restricting where the animal can be present within the rental complex. However, health and safety standards regarding the care of all animals, such as a requirement that animals be vaccinated or on a leash if that is the law, are generally acceptable. 3. Breed restrictions. Unless local law restricts a particular breed, most commonly pit bulls, breed restrictions are meaningless when it comes to reducing liabilities for dog bites or other injuries. Insurance companies report that other breeds, including Chihuahuas, German Shepherds, Dobermans and Rottweilers are just as likely to attack. A more effective screening policy is to ask the tenant about the animal’s history. See our previous post, How to Screen Tenants With Pets, for more ideas. 4. Size restrictions. The size of the animal has no bearing on whether it causes disturbances or more noise. Small dogs may bark incessantly, while larger dogs may be quite. With cats, size has virtually nothing to do with temperament. Not only does this policy discourage qualified renters with larger, well-behaved pets, but it also is difficult to enforce. It is unlikely an eviction judge will be sympathetic to booting a tenant because the animal is slightly oversized, but not misbehaving. 5. One-pet limit. There are two inherent problems with the one-pet limit. First, a roommate or child may be entitled to a companion animal, and then the landlord must make an exception. That looks bad to other tenants who were denied a second pet. Another issue is that two pets often keep one another company, and that can reduce noise complaints. Like the other restrictions, the results depend upon the specific animals, and so it is better to screen them individually rather than apply a blanket prohibition that is difficult to enforce. Number restrictions based on local law are appropriate. 6. Pet deposits. In some areas, a pet deposit can be charged to the tenant in addition to the general security deposit. However, if most jurisdictions, the pet deposit must be carved out of the general security deposit, which is capped by law. It does not make sense for landlords who cannot charge an additional amount to earmark any portion of the general security deposit as a pet deposit. By doing so, the landlord limits access to these funds unless the landlord can prove the damage was caused exclusively by the pet. Otherwise, the landlord could apply the general deposit to either pet or human damage. It certainly is understandable why some landlords fear that allowing pets will increase property damage, tenant complaints and liabilities. However, that concern needs to be balanced against the growing number of qualified renters with pets, along with the fairly-recent requirement that landlords accept companion animals. Some landlords are embracing the trend by carving out pet play areas, and even organizing pet events within the rental community. These landlords may see better tenant retention than those who restrict pets. “Pet-proofing” the units along with proper tenant screening can minimize the risks of allowing pets in rental properties.